Pinnacle Arborist Supplies was a sponsor at the TUFC (Tennessee Urban Forestry Council) TN Tree Climbing Competition on October 6th in Nashville, TN. Besides providing prizes for the winners, Pinnacle had a booth selling climbing gear. Thanks to all those who stopped buy to meet us. Don’t forget to use your discount card if you picked one up. 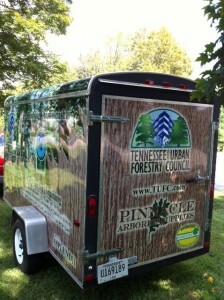 Take a look at the TUFC trailer wrap. We are very proud to be represented by them. This entry was posted in Sponsorships, Tree Climbing Gear. Bookmark the permalink.